The first coral reef status report for Western Indian Ocean (WIO) countries has been produced under the Biodiversity Programme, which is implemented by Landell Mills, managed by the Indian Ocean Commission (IOC), and funded by the EU. 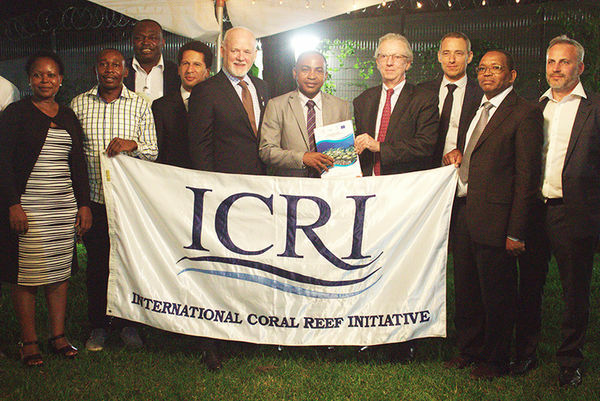 It was presented in Nairobi during the 32nd General Assembly of the International Coral Reef Initiative (ICRI). The report presents the latest compilation of data on the state of coral reefs in all WIO countries: South Africa, Comoros, France / Réunion, Kenya, Madagascar, Mauritius, Mozambique, Seychelles, Somalia and Tanzania. It also explains regional drivers of change, and recommendations for the management of associated reefs and ecosystems. In particular, it included the impact of one of the largest coral bleaching events of 2016. Coral bleaching can be fatal, and occurs when corals are stressed by changes in conditions such as temperature, light, or nutrients, and expel the symbiotic algae living in their tissues, which causes them to turn completely white. Dr Judith Nyunja, Senior Research Scientist at Kenya Wildlife Service, said ‘the situation is relatively stable after the bleaching of 1998 with losses of 25%, compared to only 10% after the bleaching of 2016. This gives hope for reef preservation if very active management measures are taken’. The Biodiversity Programme supports several regional initiatives in the management of reefs. They mainly focus on strengthening national and regional capacities to monitor coral bleaching as well as identifying coral diseases, eradicating coral-eating crown of thorns starfish, and assessing post-bleaching impacts in Comoros, Kenya, Madagascar, Mauritius, Seychelles and Tanzania and Zanzibar. Find out more about the report and the programme here.